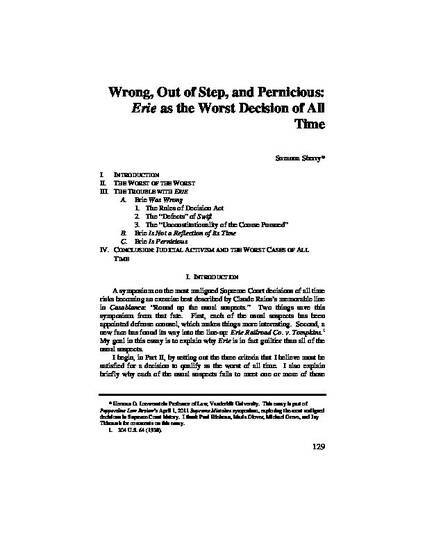 This essay was written for “Supreme Mistakes: Exploring the Most Maligned Decisions in Supreme Court History.” A symposium on the worst Supreme Court decision of all time risks becoming an exercise best described by Claude Rains’s memorable line in Casablanca: “Round up the usual suspects.” Two things saved this symposium from that fate. First, each of the usual suspects was appointed defense counsel, which made things more interesting. Second, a new face found its way into the line-up: Erie Railroad v. Tompkins. My goal in this essay is to explain why Erie is in fact guiltier than all of the usual suspects. I begin, in Part I, by setting out the three criteria that I believe must be satisfied for a decision to qualify as the worst of all time. I also explain briefly why each of the usual suspects fails to meet one or more of those criteria. The heart of the essay is Part II, examining in detail how Erie satisfies each of the three criteria. I close with some concluding thoughts on the surprising relationship between Erie’s flaws and those of the other suspects. Suzanna Sherry. "Wrong, Out of Step, and Pernicious: Erie as the Worst Decision of All Time"